The first delivery of an A320 aircraft from the Airbus U.S. Manufacturing Facility has taken place in Mobile, Alabama, USA. 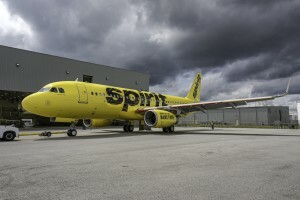 The aircraft, delivered to Spirit Airlines, is the 37th overall delivery from the U.S. facility since production began in July 2015. The previous 36 aircraft were A321 aircraft, making this delivery another important milestone for Airbus. Executives from Airbus and Spirit Airlines were on hand for the occasion. The A320 Family is the world’s best-selling single-aisle product line and comprises four models (A318, A319, A320, A321) Typically seating 150 passengers in two classes, or up to 180 in a high-density layout for charter and low-cost operations, the A320 is in widespread service around the world, flying routes ranging from short commuter sectors to coast-to-coast U.S. flights. To date, the Family has won over 13,200 orders and more than 7,700 aircraft have been delivered to some 400 customers and operators worldwide. Airbus announced its commitment to build a single-aisle assembly line in Mobile, Alabama in July 2012, and broke ground for the $600 million facility in April 2013. The ceremonial inauguration of the plant took place in September 2015. Airbus anticipates delivering four aircraft per month from the Mobile plant by the end of this year. In addition to hundreds of new Airbus jobs the project has brought to the local community, the Mobile area has seen many Airbus suppliers open new facilities in the region, providing even more employment and a parallel boost to the local economy. Airbus is proud to say that more than 85 percent of its employees are from the Gulf Coast region, with nearly one third being U.S. military veterans.